My Ántonia is one of eight classic American novels featured in the National Endowment for the Arts Big Read initiative, designed to restore reading to the center of American culture. The Big Read provides citizens with the opportunity to read and discuss a single book within their communities and is supported by expansive outreach and publicity campaigns. Over one hundred communities will participate in 2007, each with a program lasting approximately one month. A kick-off event is followed by panel discussions, film screenings, and lectures or public readings devoted to the book. Willa Cather’s heartfelt novel is the unforgettable story of an immigrant woman’s life on the hardscrabble Nebraska plains. Through Jim Burden’s affectionate reminiscence of his childhood friend, the free-spirited Ántonia Shimerda, a larger, uniquely American portrait emerges, both of a community struggling with unforgiving terrain and of a woman who, amid great hardship, stands as a timeless inspiration. 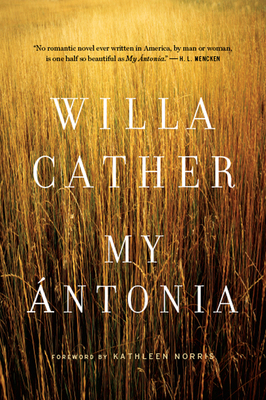 WILLA CATHER (1873–1947), the Pulitzer Prize–winning author of more than fifteen books, was one of the most distinguished American writers of the early twentieth century.